Consider these floral details in order to add more interest and beauty to your wedding day. Individually wired blooms for your hair, created to complement the chosen style. Hair flowers are specially wired in accordance with the needs of your hair stylist. To be scattered where desired, along entrance ways, tables, aisles etc. Small paper cones filled with rose petals for guests to throw. Beautiful ways of incorporating your flowers into all aspects of the reception decor. Adding a floral cake topper is a lovely alternative to the traditional "bride and groom" figures, and allows for a splash of class and colour. 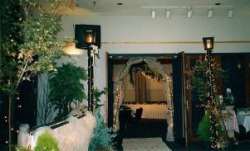 A white, pre-lit arch can add detail to a ceremony or reception venue. Tulle and flower accents can be added for that extra “touch”. We have white pillars available to allow greater visual height for flower arrangements at the ceremony and reception. Topiary stands are also available, and can be made to order. Aisle runners add so much to the overall effect of the ceremony. An embellished white aisle runner is available to rent, but we have a variety of other aisle options available to purchase as well. Your reception venue may be the place where you and your guests spend the majority of your wedding day. This is often the venue where couples spend the most amount of effort on flowers. Tie your entire wedding theme together using complementing vessels for arrangements on tables. Use interesting textures, shapes and details on tables as your guests will be close enough to admire them. Use candles for ambience and consider small details such as dressing napkins with ribbons and blooms. Created uniquely to complement your style and venue. These can range from scattered petals on tables, to single blooms sunken in vases, to large full arrangements on beds of rock salt crystals and surrounded by tea light candles. Tables are designed to suit your budget and look. Add a single bloom, foliage or ribbon touch to each napkin to accentuate and tie in with your table styling theme.